The very wordy (but alliterative!) title says it in a nutshell. Does anybody have any photos of painted examples of the old Minifig Orcs? I've found a few through Google image searches, and Caliver has some passable photos of unpainted specimens, but what I'm really looking for is what a talented painter can do with them. I realize the sculpts are old and lumpy, but that's part of their charm. At least in my mind. There is also the nostalgia factor, of course. Just received the first volume of John Hussey's Waterloo: The Campaign of 1815. Volume I covers from Elba to Ligny and Quatre Bras. Be warned, it's massive. And the bug strikes again. Should be an interesting discussion! So ideally, we now need either a picture of a pig-faced Minifigs French Guard Grenadier of 1815, or a discussion of the role of Orcs in the Waterloo Campaign? Go for the picture. Orcs are notoriously bad at correspondence and record-keeping, which limits the source material available. (I've worked with a few.) But I remember early Minifigs, and that pig-faced grenadier is a distinct possibility. I strongly suspect we will now read much detailed and entirely contradictory information about which Orc sent what message to the DoW, how long it took to get there and how every subsequent record is inconsistent about the timing of receipt. Ever been Humbugged by an Orc? I say those Dwarves or Orcs on the left flank? Yeah, the Prussian Army marching across country through the mud and arriving just in time to bail out the British is pure fantasy! Though it's not really as bad as that preposterous SF business in which a biplane torpedo bomber starts Bismark on a downward spiral. That sort of thing might be OK in Star Wars, but real life should have higher standards. While we're on the subject, what script writer came up with the notion of discovering the enemy's plan wrapped around some cigars at an old camp site? And I have been Humbugged by multiple Orcs, but I think they're all retired now too, so bygones. 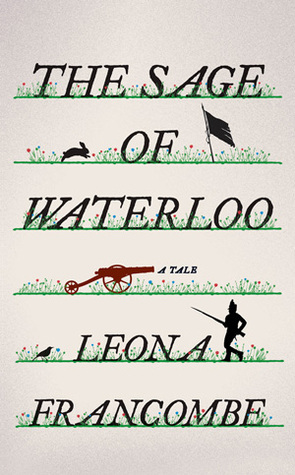 Watership Down meets its Waterloo. 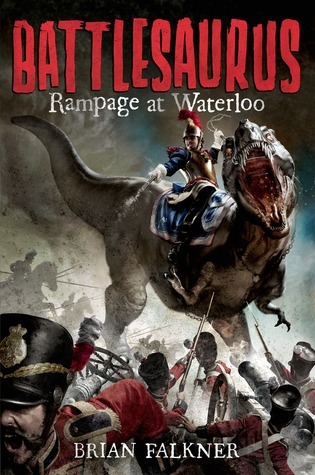 Isn't Waterloo meets orcs Slaughterloo? Impressed by the carabinier in blue coat, not white. Nice attention to detail, but the pistol holsters for a trooper naw. Square portmanteau some do argue. Cannot help but wonder if a T Rex would choose to close with a well formed square, indeed whether he would survive the impact of a 6/9pdr ball through his skull as he ascended the ridge. Let alone breathe the atmosphere of the Earth now, so different from 65 million years ago. Another thought, how useless is the rider? No sword will reach any enemy and the chances of any pistol doing any harm to anyone………. How? Accuracy vs a moving target like that would be…? I'll stick to my bear-riding dwarven cavalry, thank you very much! I like this thread a lot. This thread has a lot to answer for! I just ordered the book mentioned by Ammianus, and if it isn't filled with references to pig-faced orcs, dwarfs, and T-Rex's I'll never read another book by John Hussey! I know what KaweWZ means. 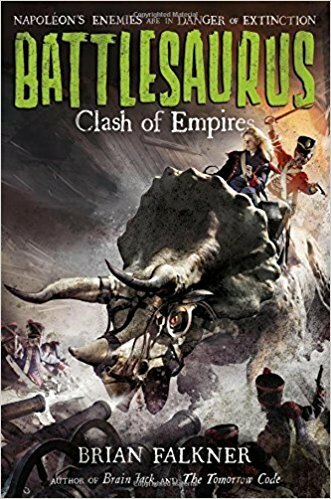 "This riveting alt history reimagines the 1815 Battle of Waterloo as something other than a crushing defeat for the French emperor Napoleon Bonaparte, when he unleashes a terrible secret weapon--giant carnivorous survivors from pre-history--on his unsuspecting British and Prussian adversaries. In this world, smaller "saurs" are an everyday danger in the forests of Europe, and the Americas are a forbidden zone roamed by the largest and most deadly animals ever to walk the earth. But in his quest for power, Napoleon has found a way to turn these giant dinosaurs into nineteenth-century weapons of mass destruction. Only Willem Verheyen, an outsider living in hiding in the tiny village of Gaillemarde, has the power to ruin the tyrant's plans. And Napoleon will stop at nothing to find him. War is coming, and young Willem is no longer safe, for Gaillemarde is just a stone's throw from the fields of Waterloo--fields which will soon run red with blood." Apologies. Mid posting I was summoned for supper, in a tone that did not suggest discussion as to timing or the possibility of a postponement. This sounds great. (I stress this is about the book featuring Dinosaurs, Triassic not Jurassic, at Waterloo and relates to the second book mentioned. Once the Bug strikes one must expect such confusion). It is aimed at kids and sounds like high class fantasy stuff. Why not? If it gets a few more kids to even know that Waterloo is not just a bridge or a station…why not? Velociraptors de la Jeune Garde, Ankylosaurs in square with their tails sticking out, Dimetrodons d'Elite, pourquois non? Turns out that the British get a go with Triassic Dinosaurs too. Snag is Triceratops was a herbivore and not an aggressive carnivore! If you can train a grazing animal to be a destrier, you can train a triceratops to do battle. If Elephants can do battle, why not the Triceratops? What I had missed first time ride was the attractive young filly atop said beast. Who makes a suitable range of female dinosaur riders in "toy shop Dino" sizing ?